Tennis can be gloriously uncertain, and it can also be cruel. The sport can be exhilarating, and it can be heartbreaking as well. Two-time US Open champion Rafael Nadal would associate with the latter part of both the above statements. In a 3rd round match against 32 seed Fabio Fognini from Italy, Nadal was pretty much in the driver’s seat with 2 sets to love up before Fognini decided to take the game to another level. The Italian went on to stage one of the most amazing comebacks of all time, defeating Nadal 3-6, 4-6, 6-4, 6-3, 6-4 in a slugfest that lasted 3 hours, 45 minutes. The Spaniard, desperate to make a comeback in this year’s US Open after a largely unsuccessful 2015 by his standards, suddenly started looking out of control once the 3rd set against Fognini started. The Spaniard saw the match slip away from his fingers as Fognini hit winner after winner, totaling 70 winners through the match. The high number of winners is shocking considering that Nadal is one of the better returners in the game, and is notorious for reaching out and returning shots which most players wouldn’t think of reaching. The loss must be heart-wrenching because Nadal was beginning to look solid, and put in clinical performances in his first 2 rounds after a 2015 where he was out of sorts for most part since making a comeback from injury. Was it really a major upset? Many would argue that this isn’t technically an upset, given that Fognini had got the better of Nadal on both occasions that they faced each other this year before this. Also, Nadal hasn’t been in the best of form this year after making a return and had seen his ranking fall as low as 10. But, consider the fact that Nadal had won 22 of his previous 23 US Open matches, including earning titles in 2010 and 2013 and reaching the final in 2011. Also, throw in the fact that the Spaniard had never lost a Grand Slam match when taking a two-set lead prior to this - a 151-0 record, and this would qualify as one of the biggest upsets on the Grand Slam stage. But Fognini was in no mood to let those streaks extend. He put in sublime no-holds barred performance to take the fight to the 2-time US Open champion. He followed the approach he used to good success twice this year against Nadal, which is taking high risks and in the process racking up a high number of unforced errors, but also, more importantly, hitting winners (70 of them). Even as he continued making unforced errors, he didn’t back off and kept going for winners down the line. The Italian Fognini has often been criticized for his emotional outbursts and his streaky temperament. He has been known to blow his lid off in matches and lose matches from commanding positions, and as a result, he has won only 3 singles ATP titles in his career, and his best result in a Grand Slam has been reaching the quarter final on the clay of French Open (his favourite surface), back in 2011. His temper was on display during the third set when he argued with the chair umpire and apparently went angrier since the umpire didn’t understand his language, Italian! 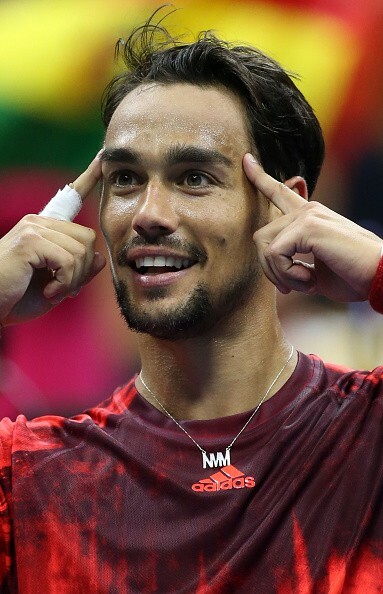 After that outburst though, Fognini showed a remarkable control over his mind as well as his game, hitting winners at will against one of the best returners in the game. And to Rafa’s credit, he was up to the challenge. Looking like the champion of old, he was hustling to stay in the points, defending with enormous tenacity, and then committing everything to his forehand when he had the chance for a counter-punch. There was none of the hesitation or uncertainty that has dogged him this season. The fifth set, which lasted 52 minutes, was filled with one apparent momentum swing after another. Starting at 1-all, there were seven consecutive breaks of serve, a pattern that finally ended when Fognini broke to go ahead 5-4, then held to end it. The usually Fognini was rendered nearly speechless immediately afterward. As Nadal’s backhanded return landed off the mark to give Fognini the match, there was no elation, no joy from the Italian, but a calm smile, standing with his hands on his waist, more in disbelief than in excitement. Then came the gesture. He pointed to his mind, indicating that it was his calmness of mind which had allowed him to win the game from an incredible situation. Rafa’s reaction was stoic as it always is. "The only thing this means is I played worse than the last 10 years," said the 14-time Grand Slam winner. "That's the real thing. By the way, for me it was amazing to win 10 years in a row a Grand Slam. "You can imagine how difficult it is to make that happen. I have to accept that it was not my year and keep fighting till the end of the season to finish in a positive way." But his face betrayed the deep disappointment at having lost a game he had in his grasp, and more importantly, finishing the year with early exits in all Grand Slams this year. The cameras caught a sad Nadal walking back to the locker room (watch here). It was over at 1:26 a.m., Saturday, local time, and straight after a crushing, and no doubt, exhausting loss, Nadal had the heart to stand and sign autographs for all the people who were stretching out from the stands. A remarkable gesture indeed, 90 seconds after having lost a pulsating 5-setter, a match he had in his grasp after being 2 sets to love up. This loss ensured that Nadal wouldn’t add to a 10-year streak of winning at least one Grand Slam title in a year. Is it the beginning of the end for Nadal? Or will the 14-time Grand Slam champion showcase one of the spirited comebacks that he is so renowned for? Only time will tell. 2016 may hold some answers.